Summary: Before -- Reena Montero has loved Sawyer LeGrande for as long as she can remember but he’s never seemed to notice that Reena even exists…until one day, impossibly, he does. Reena and Sawyer fall in messy, complicated love. But then Sawyer disappears from their humid Florida town without a word, leaving a devastated and pregnant Reena behind. There is something so achingly real about How To Love. From the few first pages, I was in the story immediately, which is a testament to the author's writing and the beautifully flawed characters she created. I wanted to know their secrets and thoughts and history. 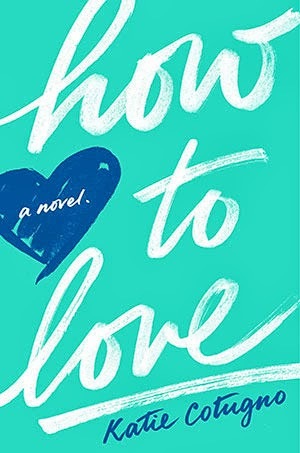 And as many books as I've read, I can't exactly describe what it takes to make me feel that way from page one but whatever it is, How To Love has it. The book alternates between the "before" and "after" of Reena Montero's life and both are equally compelling. She's extremely introverted and is happiest hanging out with her best friend. She's not the girl who's going to be out all night and large groups of people tend to make her uncomfortable. She feels like she doesn't quite fit in but she isn't constantly self-deprecating about it. She is who she is and I related to that about her. It's hard to step out of your comfort zone. In my experience, there's no rhyme or reason why one person can make you completely at ease from the moment you meet and others you need to warm up to. But Reena never expected that the person to bring her out of her shell (at least in private) would be Sawyer, the boy she's known all her life and been in love with for just as long. Sawyer isn't exactly an open book. He's got the typical bad-boy, you should probably stay away from me traits: drinking, drugs, oozing with charm, girls flock to him. The boy has got issues. And while it would be easy to call Sawyer a jerk based on his bad decisions, I didn't think that. He's flawed and it's apparent there's more to him than meets the eye. His tender and more sensitive side comes out most when he's around Reena though but it's never heavy-handed and his actions never scream "you make me want to be a better man!". Like Reena, he is who he is but she makes him feel more than anyone else ever has. It's funny because for two people who seemed so different, as I write about them now - I see how they are almost like two sides of the same coin. I really wish I had a more eloquent way of saying this but I don't, so simply put -- I loved Reena & Sawyer's relationship. It was about breaking down walls, falling in love, ups and downs. It's two very scared people who don't know what they're doing or what the future holds for them. But every emotion they went through and the author presented to us, I felt as deeply as if it were my own. So when Sawyer leaves Reena without a word, not knowing she's pregnant, I had to know how the "after" would unfold. Reena becomes a teenage single mother raising a daughter named Hannah and out of nowhere, Sawyer is back in town years later. Back in her life and asking about the child he didn't know they had until recently. Reena reacts exactly how I would expect anyone to, with anger and completely shaken up by his appearance and the affect he can still have on her. The "after" is a heartbreaking but also heartwarming look at second chances, forgiveness and timing. With all they've been through, can they still fall in love? Can your first love be the love of your life? Can Sawyer redeem himself and be forgiven? Can Reena open herself up to him again? Even if if we've never been in their exact situation, most of us can probably relate in some way to the feelings and conflict they go through. And I think that's what touched me so deeply. Because second chances and making a true connection with someone is rare. Another rave review for this book! You and Estelle are definitely making me think I need to pick up this book, even though it's not something I'd typically read based on the summary. I'll keep you posted on my thoughts if I do!